Fans are still mourning the loss of Star Wars legend Carrie Fisher, who passed away last December, a year before her final turn as Princess Leia happens in this holiday season's The Last Jedi. But one fan is taking it to the extreme, and we're sure it's just so he can get more hits on his Farmers Only dating profile for being such an awesome guy. Yes. A southern Indiana farmer has created the ultimate tribute to both Carrie Fisher and her character Princess Leia Organa. He's gone full John B. McLemore and made a corn maze in the General's likeness. As you can see in the image below, this is pretty astounding. Jeremy Goebel designed the maze himself this past February. He then planted the corn this past spring, using a GPS system to help guide him. The corn has now matured, showing off the incredible likeness of Carrie Fisher as she appeared in 1977's A New Hope. From high above the maze, you can clearly see the signature bun hairstyle, Fisher's iconic face, and the upper part of her body. Goebel spoke with the Evansville Courier & Press via The Washington Times. And he explained that he was a longtime fan of the movie franchise, and felt he needed to find a unique way to 'pay tribute to Carrie Fisher', obviously one of his favorite actors of all time. The maze, which looks quite easy to get lost in, resides at Goebel Farms in Evansville, Indiana. 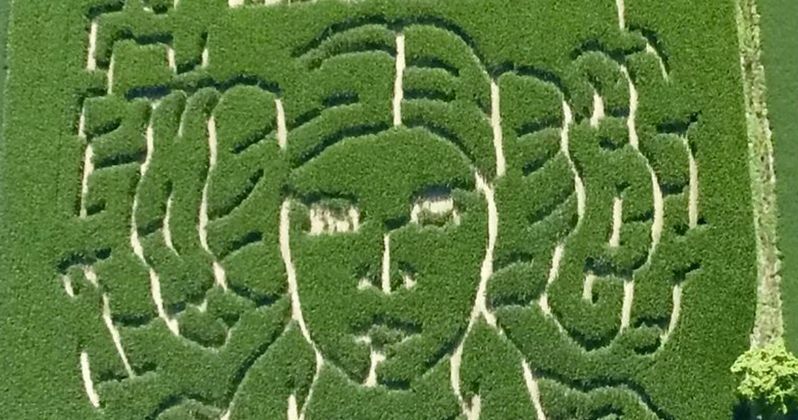 The maze was grown specifically so that above Leia's head, you could read "Carrie Fisher RIP 1956-2016." Goebel is opening the maze to tourists this weekend. But you do have to pay a small asking price to go inside and then try to find your way out. Star Wars just won't be the same without Carrie Fisher. The actress will have a substantial role in The Last Jedi. Rumors claim that she will reunite with on-screen Twin Brother Mark Hamill, who plays Luke Skywalker. There is also a scene that depicts Leia and her son Kylo Ren having a heart to heart discussion about his path in life. The character of Leia won't be killed off. Her send off is being compared to Paul Walker in the Fast and Furious movies. While her character won't return in Star Wars 9, her presence will forever be felt in this galaxy far far away. And she will always be around where fans are concerned. Just as evidenced by this corn maze, which we're sure the always good natured Fisher would have gotten a kick out of. We'll get to see Carrie one last time when Star Wars 8 hits theaters everywhere this December.